I realize that, as a balding man, I’m really not in any position to critique other men’s tonsorial choices, but recently I’ve seen two men whose hair desperately cried out for mocking. And since I am too cowardly to do it to their faces, I’ll do it here. The first was a youngish guy, about 18 or so. He’d shaved his head, but he had a beard. No mustache, just a full Lincolnesque beard. It looked like his sideburns had kept growing and growing until they met at his chin. Just a giant “U” of hair on his face. The second guy was an older guy, in his 50’s or so. He’d also shaved his head, but he’d missed a bit. He had a single band of hair running across the front of his head, a couple inches above and parallel to his eyebrows. It was about 1/4″ wide, and cut to about 1/4″ long. He had a bushy mustache, mostly gray but with hints of blond in it. It was all finished with a goatee, which was about 6″ long and died navy blue. I’d chalk it up to my being a premature old fart, but the second guy has about 20 years on me. Am I just that much out of touch with modern fashion and mores? What in hell is he doing? I don’t see why Ward (Mophead) Churchill should escape this area of criticism. I’m glad you can laugh, something dies in me when I see hair like that. Seriously, it takes away my will to live. I feel my face scrunch up, a bad taste develops in my mouth, and I have to remind myself to keep breathing. The horror, oh, the horror. Ha, the combover thing gets me running (away) every time. Can’t understand it, am mystified by it, find it overwhelmingly frightening. I just gave up on the whole “haircut” thing. Clippers, 1/2″ attachment, run it all over the head, voila! Saves me a couple of hundred bucks a year, and it looks better than 80% of the haircuts I’ve had in my life. What about the guy on “The amazing Race” who had his hair cut to about 1/4 inch length but left two little tufts in the front which he gathered in bands. Seriously, dude, what were you thinking? Business up front, party in back. The worst haircut I have ever seen continues to be…that’s right, the MULLET. Where’s your digital camera/camera phone when you need it? Ditto on the camera phone comment. It would make a good sidebar for Wizbang: phone cam shot of the week (one for babes and one for the bizarre). Blue Beard, huh? Did he have a gold ring in one ear? Was it left or right? Are navy blue goatees some kind of near-geezer fashion trend? Is it some kind of clue? Ha, as if by magic, in the course of doing some work (*cough*), I found this startling and efficient guy who makes BOTH a mullet and a goatee work. OMGosh! 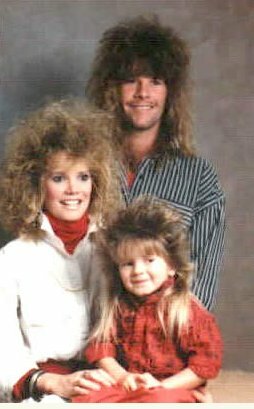 It’s the Mullet Family!! Dang the Google Image Search, dang it all to Sam Hill! Well if we are going to make fun of guys haircuts, can I please add to the list the “I just got out of bed and forgot to brush my hair” look. I have seen this on a few women, but mostly it seems to be a guy style, and it just looks sloppy, makes me want to go brush their hair for them, then take them to the nearest barber or hairstylist for a real cut. Suzy, that guy with the mullet and goatee needs to see if he can build on his success and try to make a shirt work. Suzy, you can’t lick to an Angelfire image. Angelfire doesn’t let you do that anymore (I know, they used to). Hey, McGehee, I just reprint the links as I find them, man, as I find them. Well, Henry, I just DID ‘lick to’ an angelfire pix…all I did was copy the URL from the Google Oppressor Overlord, err, the Image Search and it appeared here. I was also just reading a few pages on rense.com, so maybe there’s a correlation there. Was one of them a Resolutely Clueless Moron ?